Dresden has got some problems. Large numbers of people are being mauled during the full moon. Werewolves. Why does it have to be werewolves? Dresden has got to deal with the werewolves and not annoy Murphy to the point that she arrests him (again). Fool Moon is another fun book in the Dresden series. 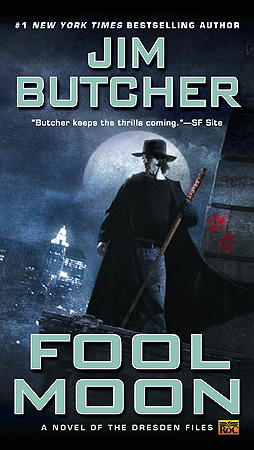 I am enjoying the series and the stories Jim Butcher is telling. The only beef that I have with the books is that I find Dresden to be so self-righteous. He feels that no one can handle knowing the whole truth. I also find his sexism frustrating, especially when he couches it in being an "old-fashioned gentleman." One can argue that these weaknesses in character make him more real, and it does, but I still find it really annoying. Most of the time I want to hit him on the back of the head. After the events of this book, however, Dresden may start to work on these character flaws before they get him into more trouble. Sign into Goodreads to see if any of your friends have read Fool Moon.